Oil traded near the lowest close in a week as U.S. crude stockpiles unexpectedly increased, keeping supplies at the highest in at least three decades with the peak summer demand period approaching its end. Futures were little changed in New York after falling 2.8 percent Wednesday. Inventories rose by 2.5 million barrels last week, according to the Energy Information Administration. The median forecast in a Bloomberg survey had projected a decline. Iraq will attend informal OPEC talks next month in Algiers, Deputy Oil Minister Fayyad Al-Nima said in a phone interview. Oil entered a bull market on Aug. 18, less than three weeks after tumbling into a bear market. Prices surged partly on speculation that informal discussions among members of the Organization of Petroleum Exporting Countries and other producers may lead to action to stabilize the market. U.S. crude supplies remain more than 100 million barrels above the five-year average as the nation’s summer driving season approaches its end on Labor Day, Sept. 5. “Crude oil imports continue at a strong pace,” said Olivier Jakob, managing director at consultants Petromatrix GmbH in Zug, Switzerland. “If imports do not stop, then stocks will rapidly reach tank top once refineries start their fall maintenance program,” he said, using the term for reaching full capacity at storage tanks. West Texas Intermediate for October delivery was at $46.73 a barrel on the New York Mercantile Exchange, 4 cents lower, at 9:30 a.m. in London. The contract slid $1.33 to $46.77 on Wednesday, the lowest close since Aug. 16. Total volume traded was about 32 percent below the 100-day average. Brent for October settlement was 16 cents lower at $48.89 a barrel on the London-based ICE Futures Europe exchange. The contract dropped 91 cents, or 1.8 percent, to $49.05 on Wednesday. The global benchmark crude was at a $2.16 premium to WTI. U.S. crude stockpiles expanded to 523.6 million barrels through Aug. 19, the EIA reported Wednesday. 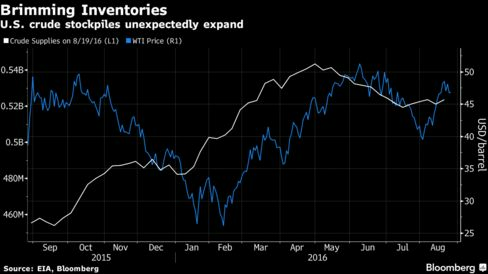 Supplies were forecast to decline by 850,000 barrels, according to the median estimate in a Bloomberg survey of analysts. Gasoline inventories increased by 36,000 barrels to 232.7 million, the EIA said.